The final of the men's Olympic hockey final proved to be as good as gold for Eric Staal and his Team Canada teammates. But that wasn't the only memorable moment for Carolina's charismatic young captain. Moments after Sidney Crosby's overtime goal put Canada on top of the hockey world at the 2010 Winter Games in Vancouver, Staal, who was recently handed the reins of the ‘Canes leadership role, found himself in the midst of another golden moment with his entry into one of hockey's most prestigious memberships. Staal, at the age of 25, became the 23rd member of the Triple Gold Club on February 28, after Canada's compelling 3-2 extra frame victory against the United States. The Triple Gold Club recognizes the exclusive pool of players who have won the three most significant accomplishments in international hockey: Gold in the Olympic Games, in the World Championship and the Stanley Cup as NHL champion. The previous 22 Triple Gold Club members were officially honoured a few days earlier on February 22 with an induction ceremony in Vancouver. Staal, who won the Stanley Cup with the Hurricanes in 2006, recorded a career-high 128 points (54 goals, 74 assists) in 107 games in his second NHL season en route to the Stanley Cup triumph. He won the 2007 IIHF World Championship in Moscow with Team Canada and netted the silver medal with his second turn one year later in Quebec City. Staal completed the Triple Gold Club hat trick by winning Olympic gold in Vancouver. He had six points (one goal and five assists) in seven games. “At my age, I feel quite honoured to be in that mix,” noted Staal, after he had celebrated with his Olympic teammates. “It's an elite club. “Hopefully I've got many more years ahead of me to add a few numbers to that,” continued Staal, who joins some of the games biggest stars in the Triple Gold Club, including Lester B. Pearson Award winner Joe Sakic, Nicklas Lidstrom, as well as fellow 2010 Canadian Olympians Scott Niedermayer and Chris Pronger. Staal wasn't thinking of personal recognition heading into the clash against the United States. It's by no means a surprise that Staal would find himself on the top of the world, both team-wise and individually. 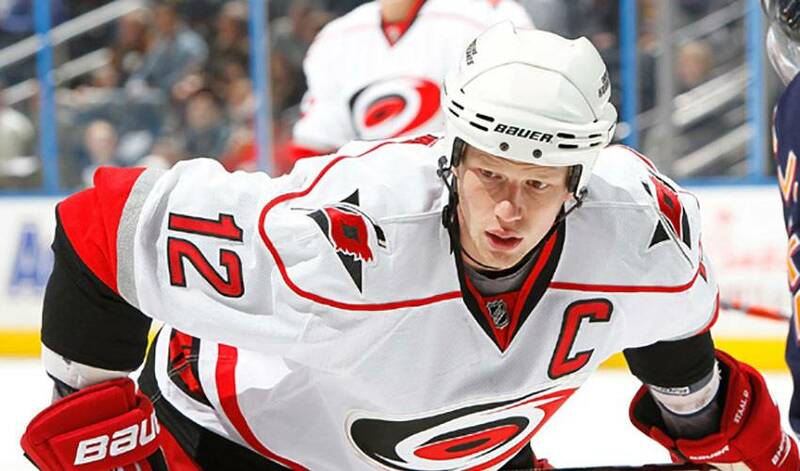 Drafted by the Hurricanes with the second-overall pick in the 2003 NHL Entry Draft, Staal has totaled 174 goals and 217 assists (391 points) in 445 career regular-season games with Carolina. He has also recorded 19 goals and 24 assists (43 points) in 43 career Stanley Cup playoff games with the Hurricanes. All of which made Staal an ideal choice to take over the Carolina captaincy. As for the reason behind his success both in the NHL and on the world stage, Staal, whose brothers Jordan (Pittsburh) and Marc (New York Rangers) are also making names for themselves at hockey's elite level, points to his parents. “They definitely played a huge, huge role,” said Staal, of his mother and father. “I mean, growing up, just like any other kid, they get you into the game. We all loved the game. Us being from Thunder Bay, there isn't much else to do in the winter. “But it was fun. They're great people. They supported us all the time, myself and my brothers. They were never ones to push or tell us to do that, tell us to do that on the rink or practice this. They just kind of wanted us to enjoy what we did. We all loved the game and we all did that. You know, they liked seeing that, but they never were ones to push us or anything. Rather, it was words of encouragement and the odd tip or two, that Staal remembers the most. But there was likely lots of screaming when it came to Eric Staal's Olympic experience, the very definition of a gold rush, hockey style.